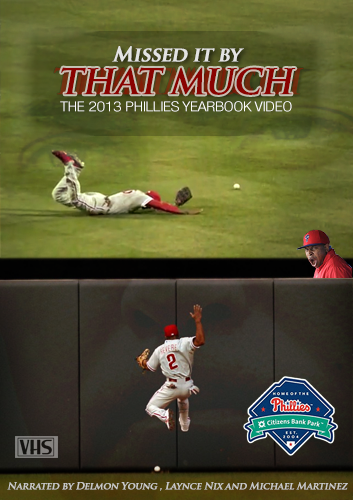 Zoo With Roy: ZWR Exclusive: 2013 Phillies Yearbook Video Cover! ZWR Exclusive: 2013 Phillies Yearbook Video Cover! An exclusive ZWR source inside of the Phillies' marketing and PR department has revealed the image below to be a fairly late-stage draft of this year's annual yearbook video. The source did not indicate why the team had begun producing the artwork for a season recap video before the trade deadline, when the team was still very much in contention, and at a time when general manager Ruben Amaro, Jr. was looking to "add a few key pieces to help us in the playoffs." How did a "past a diving Michael Young" image not make it onto this cover? How can Michael Martinez narrate something if he's dead? Or is he no longer dead? I love that it's in VHS. I just noticed this myself, that's awesome. Oh goodie, another loss. Thanks for these, it at least gives me a laugh during an awful season!